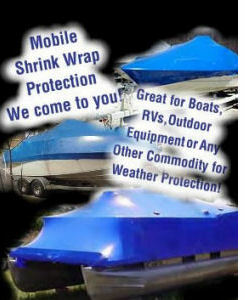 Let us help protect your boats, jet skis, snowmobiles, RVs, firewood, outdoor furniture and other valuable items from snow, ice and the harsh winter elements with a economical 7 mil shrink wrap film. High quality shrink films provide a remarkable protective cover around nearly any object. It provides a form fitting, impenetrable barrier that resists wind, rain and other elements. Because the cover is heat sealed, it affords complete protection even under the most adverse regional environmental conditions. Aside from providing an excellent protective seal, this unique wrap can be removed in minutes. Helping people put their toys away is one of our specialties. The only limitation is your imagination! 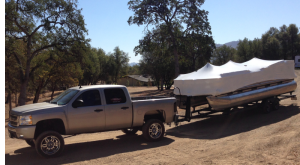 The key to this unique wrapping service is our experience customizing the wrap design specifically for the item dimensions and potential environmental conditions to protect it from. When properly applied by our skilled personnel, our high quality shrink films provide a remarkable protective cover around an object. The finished product provides a form fitting, impenetrable barrier that resists wind (extremely important during transport), rain and other elements. Because the cover is heat sealed, it affords complete protection even under the most adverse environmental conditions. In addition to providing an excellent protective seal, this unique wrap can be removed in minutes. If you require extended storage, you'll really appreciate avoiding expensive warehousing costs through the "in-place" storage advantage. Wrapped in our glove-tight cocoon, raw material, finished inventory and idle equipment can be stored up to a year or more in the great outdoors safe from the effects ...and defects ...of inferior conventional storage. And ...by sealing them in our versatile cocooning system, you'll be able to easily detect, even prevent, costly pilferage of your expensive business assets.